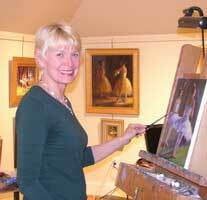 Experience a half-day instruction in painting through award-winning artists Martha Sharp and Karen Hagan as you gain experience in impressionistic oil painting. You can see Karen and Martha’s exhibits in Charleston. They also show throughout the nation. It is also possible to find their work in private collections in this country and overseas. You can take advantage of this kind of instruction just for a hobby or to advance your own artistic aspirations. Lesson is approximately 3 hours. Parking is available on-site (charges apply).